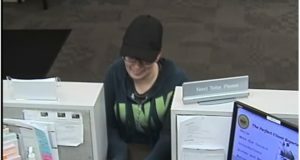 The Camden County Prosecutor’s Office and Pennsauken Township Police Department are seeking the public’s assistance in identifying a woman who robbed a bank today, Friday, October 20, 2017. 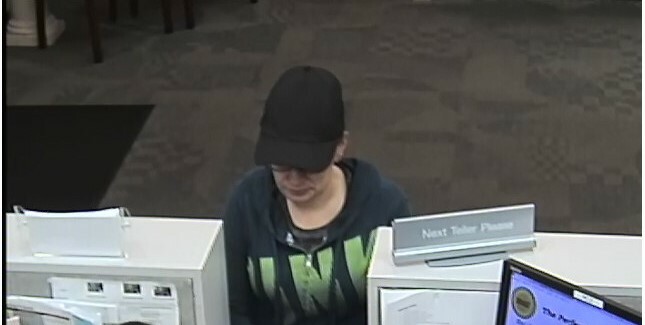 The suspect entered the BB&T Bank located on the 7300 block of Maple Avenue in Pennsauken shortly before 7:00 p.m. and passed a demand note to a teller. 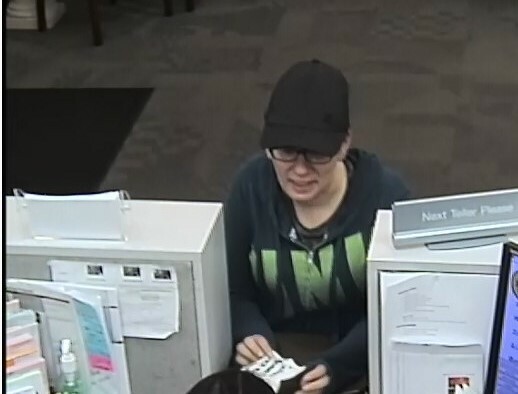 She received an undisclosed amount of cash and fled into the passenger’s side of a green 4 door vehicle headed in an unknown direction. No weapon was displayed and no one was injured. The suspect is described as a white female with dark frame rectangle glasses, acne or possible pock marks on her face, in her mid-20s to early 30s. She stands at approximately 5’4” to 5’5” tall and has an average build. She was wearing dark colored legging pants, with black flip flops, a dark colored hoodie sweatshirt with ‘Pink’ written across the front in a light color and a plain black baseball cap. Surveillance photos of the woman are posted below. Anyone with information is urged to contact Camden County Prosecutor’s Office Detective Andy McNeil at (609) 575-2231 or Pennsauken Township Police Detective Paul McCausland at (856) 488-0080 ext. 2409. Released Friday, October 20, 2017.